7 Cups of Tea (7Cups) is a mobile- and web-based chat messaging platform that provides emotional support and counseling through trained volunteers (listeners), certified therapists (pay-based), and self-help tools. Its aim is to support people (13 y/o+) who feel distressed or in need of someone to talk to. Users are welcome to initiate a chat with any of the listeners available for free, as much as they need. Listeners are trained individuals (but not professional mental health providers) who provide the service voluntarily. Users can browse through the vast number of available listeners, using available filters such as number of chats the listener has conducted, star-rating evaluation by previous users, language (many are available), topic, etc. Active support communities focused on various themes are also available. Participation in chats and support communities is anonymous. 7Cups also provides free self-help tools, such as mindfulness and relaxation techniques, and psychoeducation on various mental states. Embedded within the platform is a growth path that directs users through program use. With an additional fee, 7Cups provides various “growth path” tools targeting specific mental health issues (e.g., anxiety, family problems, OCD) and offers online therapy with a certified therapist. Warm and welcoming community for emotional support/ Free support from trained peers/ Availability of other tools (mindfulness)/ Suitable for a vast range of mental health difficulties. Users may not be sure what to do first/ The program does not really provide clear A-to-Z guidance for supporting specific conditions. 7Cups provides an accessible and convenient way to receive ongoing/on-the-spot emotional support. It is unique in terms of how peer support is embedded within the platform. It is mostly suited to people dealing with mild to moderate distress (e.g., due to current life events) or to those looking to supplement ongoing treatment. People who choose to become listeners may be empowered in a way that provides meaningful life experiences and reduces distress. 7Cups features a number of support options, such as one-on-one chat with a listener, group support chats, community forums, and online therapy. The information provided about each listener, along with the user-based rating system, enables each user to find a preferred match for his/her specific needs. In our recent review (of sampled listeners), the support experience was effective and professional. One limitation associated with the text-based support is that it may be challenging for people who do not extensively use this medium (e.g., the elderly population); moreover, some people might find the text to be limiting. Another limitation is that, for first-time users, the program’s design does not seem to tunnel them in a way that best directs them toward optimal use of the program. The main feature presented in the program is the “growth path”– a step-by-step automated program that offers users tools and exercises to help them cope with distress. 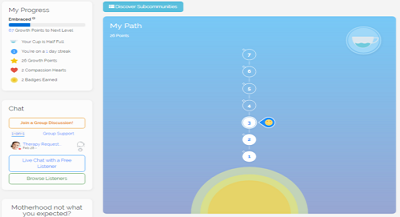 The central location of the growth path draws the user’s focus, while other features are not as prominent, including more effective support features (chats, community forum, etc. ); this may be confusing for the user. 7Cups could be included as a powerful supplement to treatment by encouraging patients to use the online chats or group support. This could be particularly beneficial for patients who seem to need additional support between sessions, such as those who are too overwhelmed and could benefit from the availability of trained supporters. Patients could also enjoy the self-help tools embedded in the program, such as mindfulness exercises and psychoeducational material. This material covers a variety of mental health themes (e.g., ADHD, perinatal mood disorders, people with psychosis, anxiety, PTSD, depression), which users could also present to concerned loved ones.